rating 7/YA? – hist. fict. I’d say this book is mostly for folks ages 16 and older because it’s not really action based (for younger people) and it weaves a theme around the idea of “what you take and what you leave behind.” This gets really interesting when Vivian, as an old woman, says she herself has been left behind. Actually, I wasn’t going to bother with this book, but a group had chosen it, I was kind of out of things to read, and it was offered on sale. So I caved, and overall was glad I did because it seemed to improve quite a lot as it went on. And I chuckled in recognition of lefse and St. Olaf and there were a few humorous passages scattered around, more toward the end. (Humor is a personal issue, I suppose.) Finally, the background information at the end of the book was good for those interested in the history – a real plus. The two major plot threads are set off in different chapters with more chapters given to Vivian’s story. Actually, the first thread is more like a frame story. And of course they come together in the last few chapters. Thread One: 2011 – Molly (?) is a 16-year old foster child due to her father’s death and her mother’s incapacity by drug abuse. She is “arrested” for stealing a book from the school library and sentenced to community service. The service turns out to be helping 91-year old Vivian Daly clean out her attic. As they sort through her stuff the old woman remembers her life. Thread Two: 1929 – The father and siblings of 9-year old Niamh (Neev) are killed and her mother incurably wounded in an apartment fire in NY tenement so she is held in an orphanage and then placed on a train to Minnesota where it is hoped she will be taken in by a family. She and her family have arrived from Ireland not too long prior. So the story of Niamh’s life unfolds and another element which kept me reading was that I actually came to care about her. This is not usually a factor in whether I enjoy a book but it sometimes counts a lot. 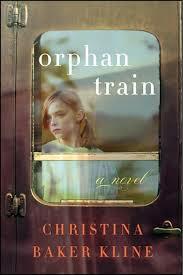 I wanted to find out how she got from being a train orphan to the big house she lives in at age 91. And of course there’s the mirroring of Molly’s story in Vivian’s – just to mention it. I’d recommend this to anyone interested in the history or to either old ladies or young ones – (16 and up generally because I don’t think most younger girls would be interested) but you never can tell.